One of the important components of your property is the driveway. Most homeowners settle to have their driveway paved, but what you pave it with is usually a question for debate. Concrete drives tend to be among the most cost-effective options. With a low maintenance schedule and a long lifespan, concrete tends to be the top choice. Here are the benefits of having a concrete driveway installed. Don’t worry about wasting your time on driveway maintenance. One of the biggest benefits of a concrete drive is that you spend less time on maintenance and more time enjoying the new look. With concrete, it requires less upkeep and repair. You can take care of it simply through sweeping and rinsing it of debris when necessary. A well-maintained and beautiful concrete driveway can seriously increase your property value and curb appeal. Whether you are looking to sell your home or you simply want a driveway that you’re proud of, concrete accomplishes your needs. On the one hand, they do not require much maintenance, which makes them more appealing to potential buyers. 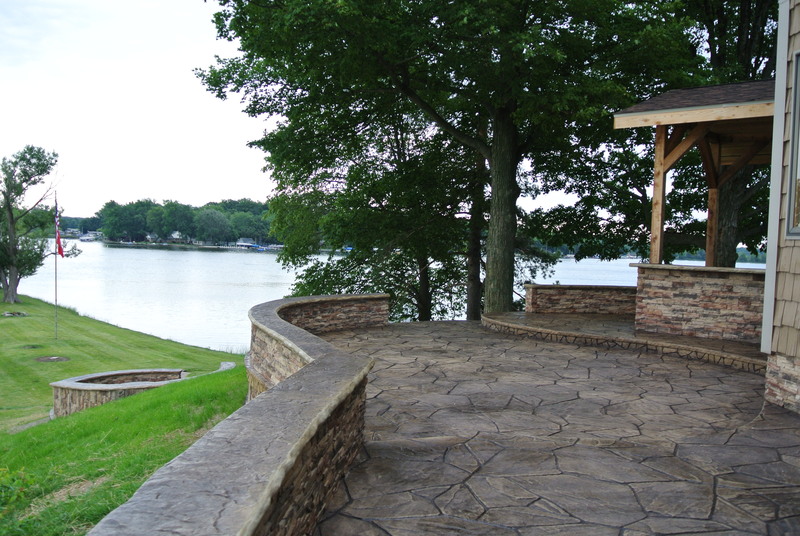 Your home simply has more value when you utilize concrete. The durability of concrete is what makes it stand out to commercial and residential property owners. It can take a lot of traffic but also, it lasts for a long time. To have to put in an entirely new driveway is a pain. It’s better to do it once and not to worry about it for a while. With a concrete drive, you can have it up to 20 years. A driveway needs to last. It has to be able to withstand the elements, traffic and anything else. One of the most solid and long-lasting materials that does the trick is concrete. When you invest in professional concrete driveway installation, you’re investing in the future of your home. Wooden decks are beautiful, but they often require lots of maintenance and will need to be repaired and replaced over time. In contrast, a concrete patio can last a lifetime as long as they are regularly cleaned and there are no cracks for water and ice to get into. 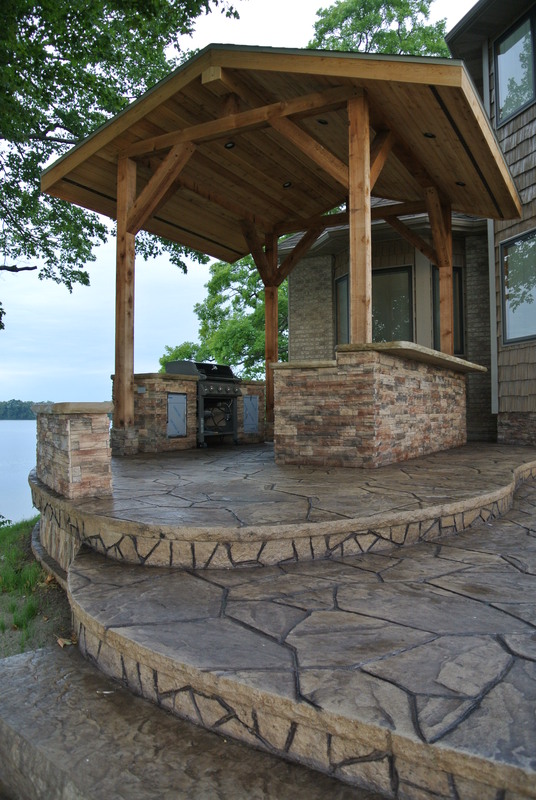 Compared to wooden decks, concrete patios are also more cost-effective from building to maintenance. Even so, many homeowners dislike the sometimes bland appearance. Still, there are several methods you can use to spice things up. Imprinting could leave you wondering if you ever used concrete at all. From creating wooden looks to brick features and even adding a touch of color, this can create a perfectly unique style that complements your home’s current decor. Staining a concrete patio is a nice way to add a protective coat while giving it a fresh new look. Many homeowners go for an aged look that resembles centuries-old stone. It is important to note that stain will need to be reapplied occasionally as it doesn’t always hold up well to the elements. The upside of this is that you can always allow it to fade and then change the stain. This creates a geometric design that often mirrors the look of tiles. The squares can be as large as a parking space or as small as a brick. 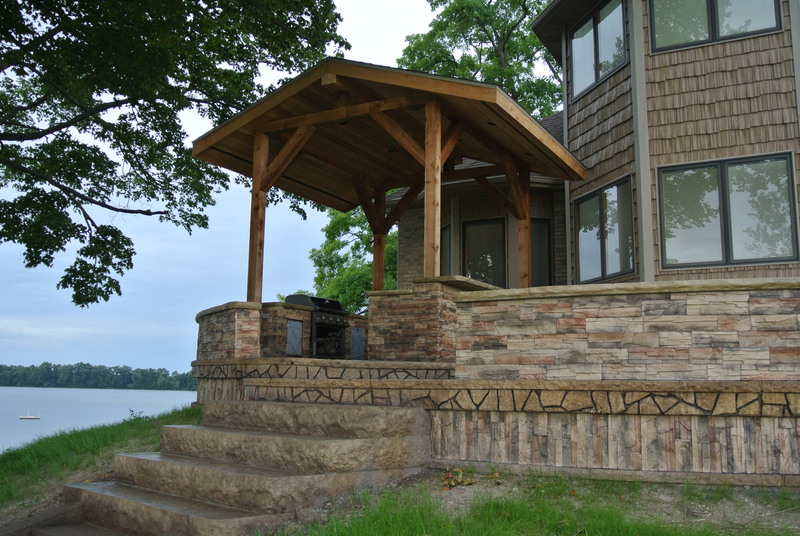 Concrete scoring may be most common on commercial properties with large outdoor spaces, but when used appropriately, it also makes a beautiful design for the home. If you love the simple and minimalist industrial look, ask your contractor about a smooth finish. Acid etching and sandblasting are two useful ways to soften the concrete and create a stunning floor space. It doesn’t take much to beautify a concrete patio. 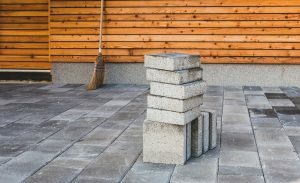 Coupled with low cost and high durability, concrete is one of the best materials you can use to build your outdoor spaces. If your property needs sprucing up, but you don’t have time to nurture plants and trees, hardscaping might be your ticket to creating an outdoor paradise on your property. Hardscaping is creating a landscape by using non-living items. From walkways to fountains, you can make your home a place of beauty without worrying about constant care. 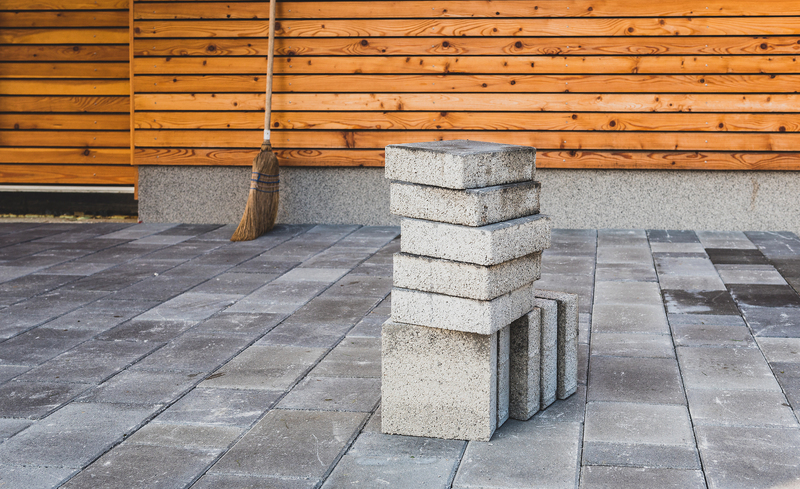 If you travel a lot for work or you take long vacations, Hardscaping will work for you because maintenance is limited once the items you wish to use are installed. Flower gardens need constant watering and weeding. Trees and shrubs need to be pruned, but hardscaping items, such as gazebos and walkways beautify a home and require limited or no maintenance. While making a home’s exterior attractive is the purpose of hardscaping, there also are other benefits. When you use hardscaping at your home, you help increase the value of the property. Fences and rock walls improve the look of your yard, but they also create privacy and act as a sound barrier. 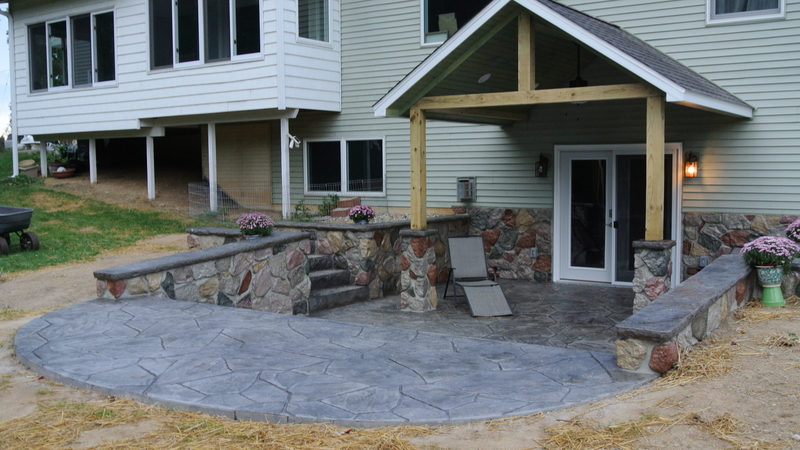 Stone walkways improve the look of your grounds, but they also make access to your door easier for your guests. Your neighbors will be attracted to the style a gazebo brings to your home, but your family will enjoy all of the activities that are possible thanks to the added structure. The gazebo gives you the opportunity to enjoy outdoor meals; it also gives you a place for family activities, such as games or family meetings. It even gives you a bit of shelter, if you care to spend some time watching the rain fall. Just because you don’t want to spend your free time working in the garden or pruning trees doesn’t mean your home’s yards need to look shabby and sterile. Hardscaping is your answer to creating an awesome outdoor environment for you and your family to enjoy. You know all about landscaping, but have you heard of hardscaping? 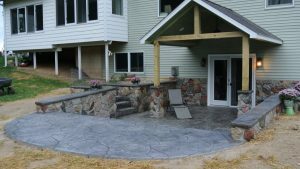 Generally, hardscape refers to the man-made or nonliving features applied to any landscaped environment. It also includes still and moving water features, such as ponds, falls and fountains. When you add these types of elements to your residential property, you can enhance its aesthetic and real estate value. If you’re thinking about installing a new driveway, you probably know that there are a lot of options out there. One of these options is a concrete driveway. If you are on the fence about it, here are five reasons you should install a driveway made out of concrete. Mild summers are made for relaxing in the backyard, grilling burgers, and spending time with friends and family. Some smart landscaping, innovative products and thoughtful accessories can create the ideal setting for a stylish outdoor room. Lush greenery and beautiful shade trees can deliver a measure of privacy no matter how large or small the space, while a balanced mix of hard and soft materials frame vibrant flower beds and cozy furnishings perfectly. Nothing says outdoor elegance like gracious flagstone patios. With the trend of transitional living spaces on the rise, adding a patio can increase your home’s value, as well as adding beauty and functionality to your outdoor living area. Over half of the people looking for a new home said one of the things they are looking for is outdoor living space, whether it be a patio, or a full outdoor kitchen. It’s easy to see why. Having a beautiful garden filled with flowers, family and friends makes a great place for gathering. Make your backyard patio a gathering place of comfort and style. 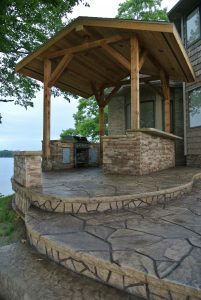 There are many different materials you can use to create an outdoor eating area, but concrete patios are among the least expensive and most versatile available. 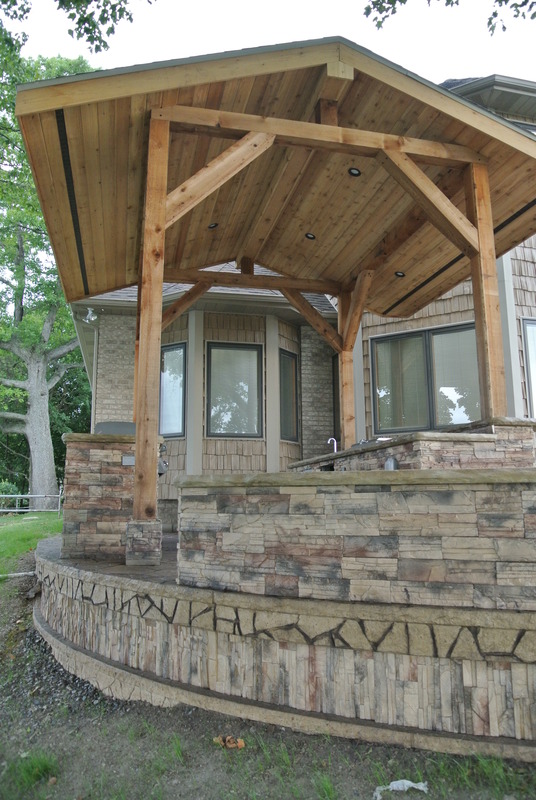 With a beautiful new space, you can add artistry, function and value to your outdoor living. The strength and durability of concrete make it a popular and versatile choice for concrete patios. If you’re thinking of redoing your outdoor space or adding something totally new, this time-tested material is worth your consideration. Replicating the look of natural stone without the need for resource-exhaustive quarrying and shipping, concrete countertops are often a greener option than marble or slate. However, in order to make certain that your new kitchen or bathroom workspace is as eco-friendly as possible, make sure to discuss the following items when choosing a contractor for your project: concrete composition, using recycled decorative accents and non-toxic sealants, and choosing a design that’s both functional and timeless.